Morning brought some twisted cirrocumulus clouds with it, implying a bit of upper-air instability. 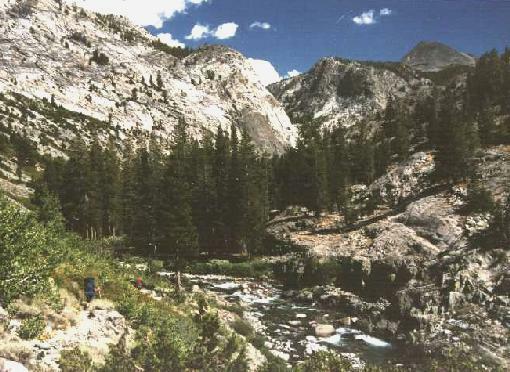 We hit the trail about 9:30 and headed toward the Muir Trail along the spectacular canyon of Piute Creek. After passing a stock gate and a nice camp, we came to the stairstep falls that I remembered from the '96 trip - but the view was even more spectacular than my recollection! 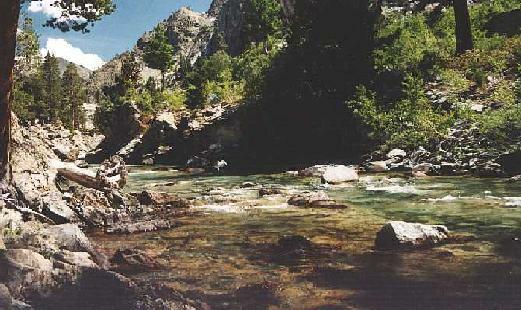 We took many photos from here, reveling in the great view and the loud roar of the water in its canyon. 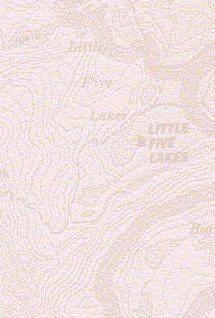 That was the last decent camp for several miles, as the canyon closed in with steep slopes and very few trees. We literally bushwhacked our way through the manzanita as the canyon fell toward the South Fork San Joaquin. The open slopes and lower elevation combined to make the day warm up in a hurry. 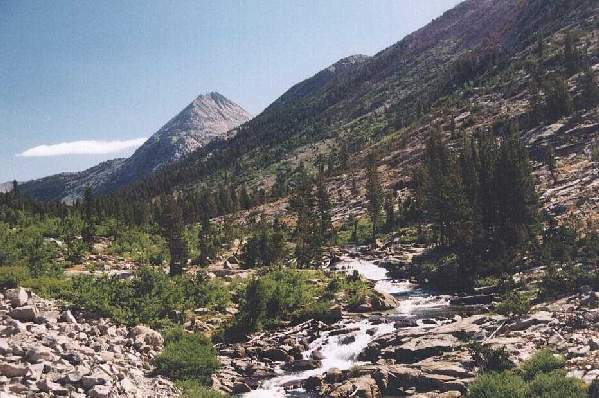 The trail made its last moves along Piute Creek, and we soon reached the bridge marking the Muir Trail junction and our entry into Kings Canyon NP. My memories of this spot from the 1996 trip were of laying flat on a rock looking at the clouds, noting through the haze of pain from my knee that it wasn't going to rain on me that day. We sat in the shade of a huge juniper and ate lunch, then prepared to move south for a few more miles. The heat that had tickled us earlier now switched to a sledgehammer, beating on us mercilessly as we struggled up the gentle trail. A few cumulus clouds had formed this day, but not enough for shade or showers to relieve the heat. After less than an hour of hot work, we dropped our packs and jumped in the South Fork San Joaquin for refreshment, a brisk and thoroughly pleasant decision! A pack train passed by as we relaxed, but they didn't seem to mind our packs by the trail - a good thing since we weren't in any position to move them! Thus reinforced against the heat, we regained our packs and moved on, soon reaching the middle bridge over the South Fork and plenty of welcome shade. The upper bridge appeared shortly thereafter, and we went further up-canyon in the hope of finding a camp away from the Muir Trail traffic. The best camp was already taken, and the trail began a steep climb, so we retreated and found a spot about a hundred yards above the bridge. Another cheerful fire was soon crackling away, and we went to bed in a good state of mind. a GREAT place to soak!